S’more inspired desserts seem to be one of the latest trends right now. The flavor is great for fall because of all of the bon fires and outdoor gatherings. Have a great week! Adapted from Teacher by Day, Chef By Night. Preheat oven to 350 degrees F. Line standard muffin pans with 24 cupcake liners; set aside. Place the graham cracker crumbs, 2 tablespoons sugar, and melted butter in a large bowl; stir until well combined. Place 1 tablespoon of the graham cracker mixture prepared earlier into the bottom of each prepared muffin cup. Use the bottom of a small glass to pack crumbs into the bottom of each cupcake liner. Reserve remaining graham cracker mixture for topping. Place the pans in the oven and bake until the edges of the graham cracker mixture is golden, about 5 minutes. Sprinkle a few mini chocolate chips on top of the prepared graham cracker crust. Then fill liner 3/4 full with cake batter. Return to oven and bake until tops are firm and a cake tester inserted in the center comes out clean, 18 to 20 minutes. Beat butter until fluffy. Beat in marshmallow creme until incorporated. Add sugar and beat until fluffy (3-5 min). Add the vanilla extract and beat another 30 seconds, taste & decide if you want/need more marshmallow or if needed, add milk to get desired consistency. If you want to really step these cupcakes up a notch, you can pipe the cream into the center of the cupcake. Frost cupcakes and top with Hershey’s chocolate piece and graham cracker mixture. 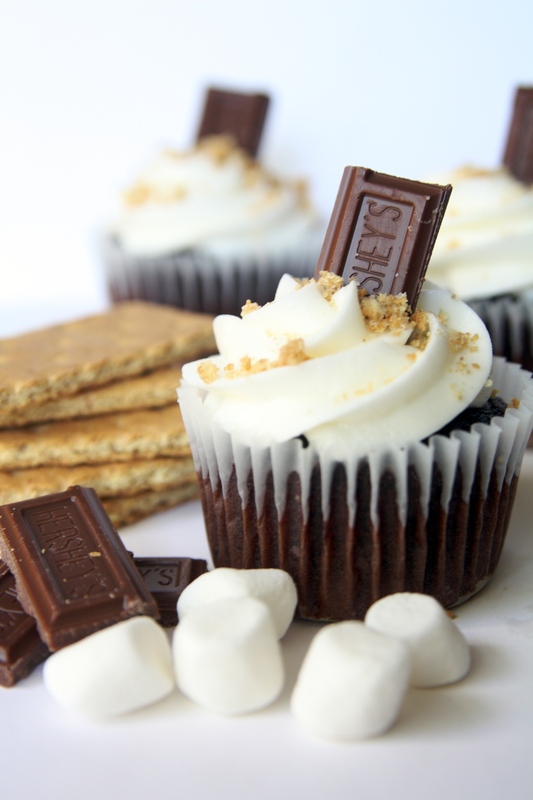 What says summertime more than some s’mores cupcakes? I set out to make these sweet confections but wanted to try a homemade marshmallow frosting that didn’t call for store bought fluff or marshmallows. The directions were very specific and should be followed accordingly to achieve the right consistency. Boil exactly 5 minutes reaching a temperature of 245 F. (You should see thick clear bubbles.) Remove from heat and slowly add the sugar syrup only a little at a time to the egg whites and beat on high speed for excatly 7 minutes. On the last minute, beat in the vanilla extract. Voila! That’s it. Pipe on, add a Hershey’s square and some graham cracker crumb and enjoy….Happy 4th of July!